Do You Hate Blogging – But Know It’s Important? 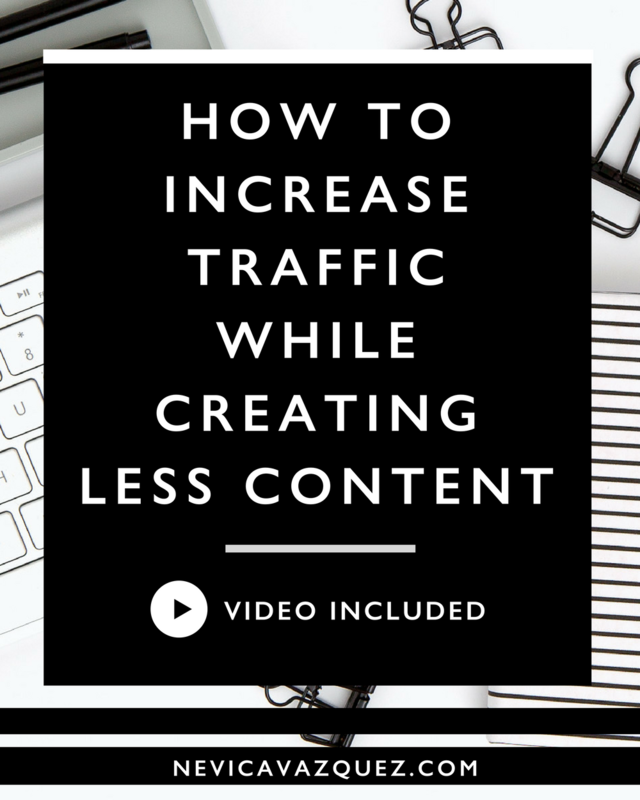 Here’s a real solution, to creating less content but receiving the same benefits of consistent content creation, that you and your audience will love! It’s starts with a story about one of my clients..
Lani gets all of her business through referrals. She has a service based (online business management) business and get’s paid by hourly packages. Right now though she’s in the process of changing her business model so that she can scale her business and no longer trade dollars for hours. Since she’s changing her business model she can no longer only rely on referrals. She needs a marketing strategy that will get her in front of more people. But she’d told me more than once that she hates creating content! While I honestly don’t think that everyone has to have a content marketing strategy, from the outside looking in I knew that Lani already had a team in place who could create the content for her! So all she needed was a mindset shift on content creation – in particular, blogging. Lani had told me in the past that what intimidates her about blogging is that it never ends. It seems like once you start you have to blog every week until the end of time! And if you don’t, then you look like a disappointment or like you can’t manage it. YOU JUST NEED A FEW GOOD BLOG POSTS TO BRING CONSISTENT TRAFFIC TO YOUR SITE AND TO BOOK YOU AMAZING CLIENTS. Yep that’s right, I’m going against the “stay consistent” rule and I’m saying: only create a few amazing posts that you can rely on for a year or maybe even more! I know this might sound crazy since it’s against the norm, so let me explain it a bit more. For a visual example of this here are two ladies, one who has her main blog landing page [yourwebsite .com /blog] set up this way (what I recommend) and another who has her blog archive page set up this way (a great alternative). As you can see with both of these examples the blog posts are organized by category. If I go to your blog I can learn about exactly what I want to learn about by simply clicking on which category I’m interested in. So there’s no scrolling though a list of most recent posts, as a reader I get access to what I want access to quickly. I’ve collaborated with Jess the Graphic and Web Designer behind Jess Creatives. 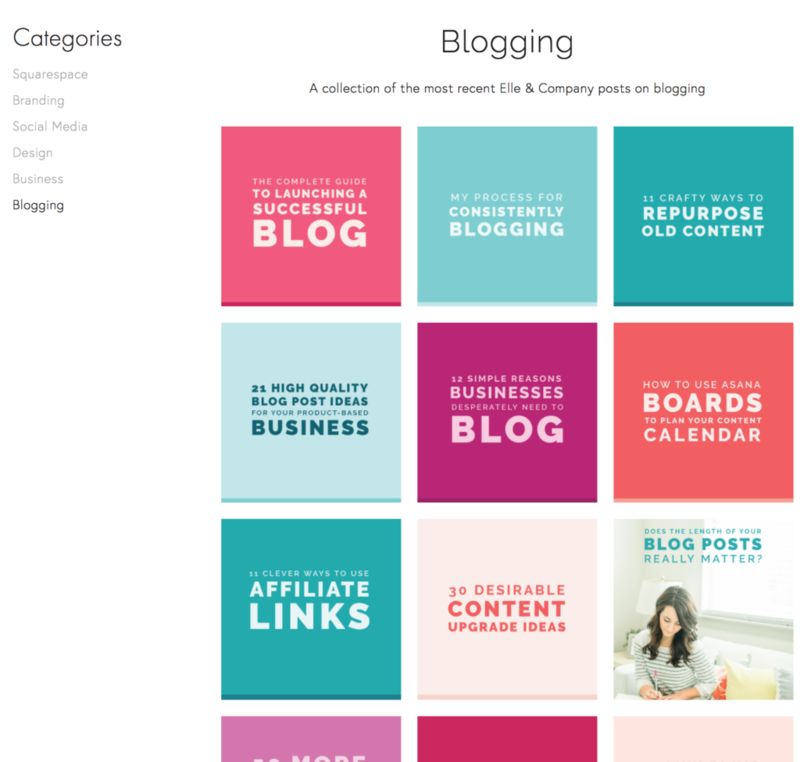 To show you how to setup your WordPress or Squarespace site in this grid like directory style! Check out the video below! You can also see that there are only a few posts in each category as opposed to an infinite amount of posts. This is where the real mindset shift comes in. When you display your content differently you don’t need to consistently create. If you’re a Brand and Web Designer you only need a few categories and a few posts in each category that will attract a new audience and lead to your paid offers. Once you’ve created product aware posts and displayed those posts differently it’s time to continue to promote that content so that it drives consistent traffic to your website. That’s where Pinterest comes in. While I’m definitely not a Pinterest expert, I know that most of my clients get 80% – 90% of their traffic from Pinterest by pinning to group boards. By setting up your Pinterest scheduler to consistently pin the few blog posts you have to group boards every single week, you’ll begin to get consistent traffic to your site. My friend Jess has used Pinterest to triple her website traffic to 10,000 + visits per month. If you want to know exactly how she uses Pinterest to increase her website traffic check out her system here. 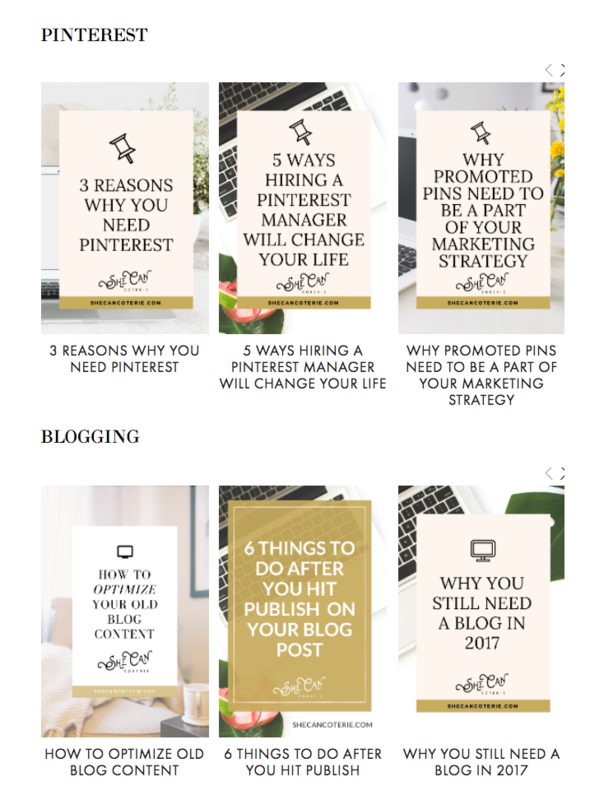 My friend Mandi from She Can Coterie has Pinterest management services so that you can grow your traffic monthly without lifting a finger! Check out the services here. So what was the point of this different strategy? If you’re afraid of blogging or content marketing because it seems like too much work, or a big commitment, it doesn’t have to be. This is the simplest way to start or get back into blogging without the big commitment. To help you get started I’ve created a checklist with every step you need to start blogging less while increasing your traffic! Check it out below! *Disclosure: Please note that some of the links above are affiliate links, and at no additional cost to you, I will earn a commission if you decide to make a purchase.